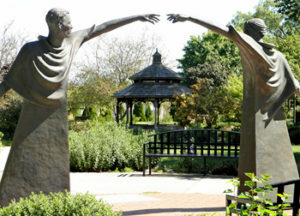 Since it’s inception in 1993, the development of Kate’s Garden has truly been a community project. It is operated and administered by the Mishawaka Parks and Recreation Department. 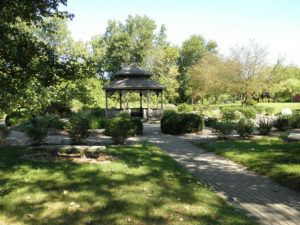 The Mishawaka Lions Club built and maintains the Gazebo that is the centerpiece of the Garden. The St. Joseph Valley Master Gardeners Association (SJVMGA), are cultivating Kate’s Garden into an outdoor classroom. Our purpose is to educate the public about growing plants and to more effectively extend information related to plants and home horticulture. Catherine “Kate” Kosanovich was a long-time community leader. In the early 1970’s she served on the Town Board in Osceola, 20 years later, when Robert C. Beutter was elected mayor of Mishawaka, he hired Kate to be his administrative assistant. She later became Director of Human Resources, and after that, was named City Controller. Throughout her life Kate was active in local organizations such as Real Services, United Way, American Cancer Society, Disability Rights Commission, and the Substance Abuse Task Force. Kate died in 1993. Kate was an avid gardener. It was noted by Mayor Beutter at her funeral that, “her garden would live forever in the ‘starts’ of various plants she had given her friends over the years.” The park at the corner of Logan Street and Lincoln Way West was named Kate’s Garden in her honor. The original concept was to have local gardeners bring perennial cuttings from their own gardens, this would make Kate’s Garden truly a community effort. On July 23, 2001, a memorial stone was dedicated to Kate in honor of her years of community service. The stone is located near the east sidewalk entrance of the garden. Learn more about our new charitable endowment with the Community Foundation of St. Joseph County!